The DFL is wide-eyed in anticipation for what is shaping up to be a banner year at the ballot box for the party in the Gopher State this November. To be sure, Democrats still have much work left to do – shoring up support for down-ballot statewide nominees Senator Tina Smith and particularly Congressman Keith Ellison in his bid for attorney general against former GOP state Representative Doug Wardlow. If they do, Democrats will be in good shape to extended their statewide electoral winning streak from its current party record of 14 in a row to 20. The DFL is also well-situated to flip congressional seats in the 2nd (Jason Lewis) and 3rd (Erik Paulsen) districts, but will also have to continue to spend considerable resources to ensure they hold the open 1st and 8th CDs. At the bottom of the ticket, the question remains as to whether the anticipated Democratic wave can propel the party to pick off enough seats to regain control of the Minnesota House of Representatives. [DFLers need to net 11 seats to take a narrow 68-66 seat advantage in the chamber]. On paper, there are plenty of competitive districts for each party to try to flip in November. Republicans won 13 seats by less than 10 points two years ago: House Districts 05A (Matt Bliss), 14A (Thama Theis), 14B (Jim Knoblach), 28B (Gregory Davids), 32B (Anne Neu, 2017 special), 37B (Nolan West), 42A (Randy Jessup), 44A (Sarah Anderson), 49A (Dario Anselmo), 52B (Regina Barr), 54A (Keith Franke), 56B (Roz Peterson), and 57B (Anna Willis). Of course, during wave elections, districts won by less than 20 points are not impervious to flipping. An additional 17 seats were won by the GOP by less than 20 but more than 10 points: Districts 05B (Sandy Layman), 10A (Joshua Heintzeman), 17A (Tim Miller), 17B (Dave Baker), 21A (Barb Haley), 23B (Jeremy Munson), 24A (John Petersburg), 24B (Brian Daniels), 26B (Nels Pierson), 34B (Dennis Smith), 36A (open), 38B (open), 39B (Kathy Lohmer), 53B (Kelly Fenton), 54B (Tony Jurgens), 55A (open), and 56A (Drew Christensen). For their part, Democrats have to defend 10 seats decided by single digits last cycle including four open seats: Districts 04B (Paul Marquart), 19A (open), 20B (open), 25B (Duane Sauke), 27B (Jeanne Poppe), 37A (Erin Koegel), 44B (open), 48A (Laurie Pryor), 50B (Andrew Carlson), and 57A (open). The DFL are certainly optimistic about retaining control of the governor’s mansion with Congressman Tim Walz at the top of the ticket – but a Walz win in and of itself hardly guarantees Democrats will flip the state’s lower legislative chamber. Over the last 11 cycles since 1974 when state legislators returned to the ballot with partisan designations, DFL control of the state House of Representatives has coincided with party control of the governor’s office just five times. The DFL enjoyed control of both institutions after the Elections of 1974, 1982, and 1986 with Republicans controlling both after 2002. 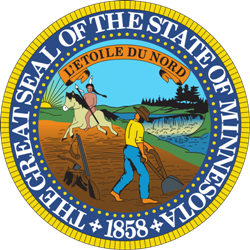 In three cycles the DFL lost the governorship but won the House (1990, 1994, 2006) and in two others won the governorship but lost the House (2010, 2014). [In 1978, Republicans won the governor’s race and each party won exactly half of the state’s 134 house districts. In 1998, the GOP won the House as Reform Party nominee Jesse Ventura was elected governor]. Control of Minnesota’s legislative chamber has, however, been more closely correlated with which party rules the U.S. House. Overall, the party winning the U.S. House has controlled the Minnesota House in 17 of 22 cycles since 1974 including nine of the last 10. Since the Election of 1974, Democrats have won the U.S. House in 12 cycles and the DFL has followed suit winning the Minnesota House in 10 of these: 1974, 1976, 1980, 1982, 1986, 1988, 1990, 1992, 2006, and 2008. Aside from the aforementioned 1978 cycle that resulted in an equal number of DFL and GOP legislators, the DFL only fell short of a majority in 1984 when Democrats won 253 seats in the U.S. House but 65 seats in the Minnesota House. During this same five-decade stretch, Republican-control has also generally reflected national outcomes. During the 10 cycles during which the GOP won control of the U.S. House, Minnesota Republicans won a majority of state House seats in seven of them (1998, 2000, 2002, 2004, 2010, 2014, and 2016) and failed to do so in three (1994, 1996, 2012). Previous: Which States Have the Largest (and Longest) Streaks Fielding Candidates from Both Major Parties in US House Races? 3 Comments on "Will Minnesota Democrats Take Back the State House?" 1998: True, the Rs won control of State House, and its gubernatorial ticket did finish ahead of the DFL counterpart by 34.3% to 28.1%. However, both ended up losing the GUV/LTGUV election to the lineal antecedent of the state’s Independence Party. Yes – that is an important clarification that should be noted. Thank you! We’re going to find out IF the MN Dems can win back the MN House of Representatives next Tuesday night.